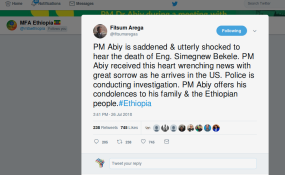 ADDIS ABBA (ENA) - The government of Ethiopia expressed its condolences over the death of Engineer Simegnew Bekele, Project Manager of the Grand Ethiopian Renaissance Dam (GERD). Eng. Simegnew was found dead yesterday morning in his car parked at Meskel Square, in Addis Ababa. The statement stated _that the Government Commu- nication Affairs Office sent to ENA values the role that the late Eng. Simegnew has played in the construction of GERD. The statement said that Eng. Simegnew has special place in the heart of Ethiopians due to his contribution to the country's flagship hydropower dam that will generate more than  MW. He displayed his passion and love for the country and the people by devoting himself to the project that Ethiopia is building along the Nile, it said. Police has started inves- tigation to identify the cause of his death.